Charles Francis Nash was born July 24, 1942 in Jersey City. His bright white hair as a boy earned him the nickname Cotton-Top, or Cotton for short. When Cotton was a boy, the Nashes moved to Texas, and then to Indiana. His father was an engineer for DuPont and thus the family relocated several times. Baseball was Cotton’s favorite sport—he had a live arm, strong body and great hand-eye coordination. However, after arriving in Southern Indiana as a sixth grader, he got hooked on basketball. Cotton played two seasons of basketball for Jeffersonville High School . His coach was Ralph Barker, a member of Adolph Rupp’s championship teams of the 1940s. Barker told Rupp to keep an eye on Cotton. The Nashes moved again after Cotton’s sophomore year in high school, this time to Lake Charles, Louisiana. Cotton grew to 6–5 at Lake Charles High, and earned another nickname, the Bayou Bomber. He was recruited as a basketball and baseball player, even though his school did not field a baseball team. Cotton also played receiver on the football team. Cotton’s most ardent suitor was John Wooden, the coach of the UCLA Bruins. Cotton decided to stay local, however, and accepted the scholarship offered by Kentucky (at the urging of Barker, his coach back in Indiana). Cotton was a major star from the moment he joined the varsity, scoring 25 points in his first game. He spent the bulk of his time playing center, but could handle just about any other role on the floor. He was an All-American all three years in a row and averaged 22 points a game for his college career. Cotton was the quintessential scorer, with quick moves, a dependable outside shot, and a lethal left-handed hook. He was unfazed by the defenses his faced, including double- and triple-teams. He reached the 1,000-point plateau in his 45th game—faster than any Kentucky player before or since. In 1964, Cotton was selected by the Los Angeles Lakers with the 12th pick in the NBA Draft. He also signed a baseball contract with the Los Angeles Angels, choosing them over the Yankees and Mets. Cotton had continued to play baseball at Kentucky, and in 1963—after his family moved to Massachusetts—he competed in the Cape Cod League, leading his team to the championship. Cotton played in the Angels system starting that summer, and was a feared minor-league slugger during a nine-year pro career. He blasted 185 home runs, including three seasons of 30 or more. He reached the majors in 1967 as a member of the White Sox, and played for the Twins in parts of the 1969 and 1970 seasons. In 1969, manager Billy Martin used Cotton as a pitcher in a game. In all Cotton appeared in only 13 games as a big-leaguer. The highlight of major-league career probably came in the ninth inning of Joel Horlen’s 1967 no-hitter. He entered the game as a defensive replacement at first base and recorded all three putouts. The victory came in the midst of wild September pennant race. Cotton’s pro basketball career consisted of two seasons. He began the 1964–65 season with the Lakers but was released after 25 games. He was picked up by the Warriors in February and saw a decent amount of action. He did not make the club in 1965–66. Cotton got a second chance when the American basketball Association was formed in 1967. 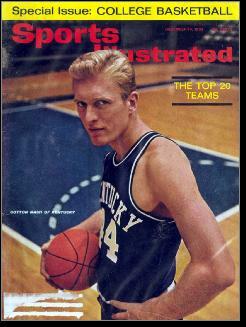 The Kentucky Colonels wanted his star power and he made the team as a power forward. He started for the Colonels early in the season, but after a coaching chain he was relegated to second-string duty and quit the team so he could get ready for Spring Training. Many fans believed that Cotton could have found stardom at the pro level had he picked one sport and stuck with it. An ankle injury suffered at Kentucky plagued him during his baseball career. His long summers of baseball made it hard to play at a high level for an entire basketball season. After his sports career, Cotton chose to go into the investment field instead of dentistry. He and his wife, Julie, also got into the thoroughbred business in the Lexington area. Still a revered figure in Kentucky sports, he spends more time watching his grandkids’ games than he does attending Wildcat hoops contests.